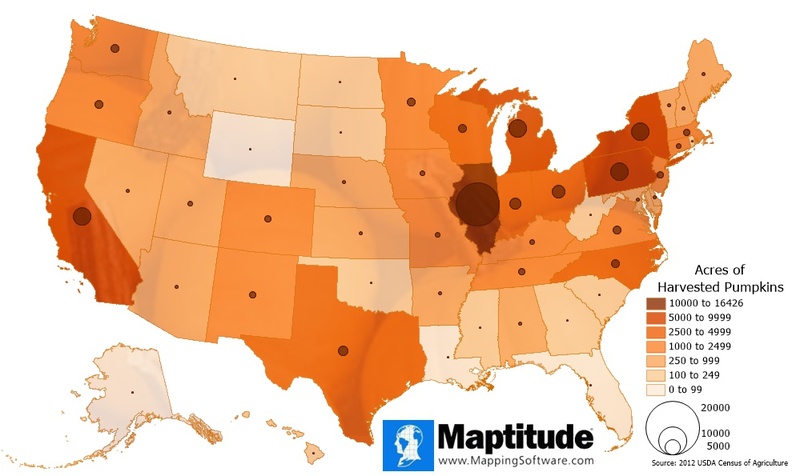 This map, made with Maptitude 2014, shows the acres of harvested pumpkins by state. Illinois leads the nation in pumpkins harvested with over 16,000 acres, followed distantly by New York, Pennsylvania, and California, each with approximately 6200 acres of harvested pumpkins. Alaska and Wyoming are the smallest producers of pumpkins with just 3 and 4 acres harvested respectively. Please include attribution to www.caliper.com with this graphic.